Ultrabook flair. On a limited budget - but drawn to stylish and thin notebooks? Those not wanting to spend the money for an Ultrabook might be interested in Acer's new 14-inch Aspire V5. Price point: 400 Euros (~$520). 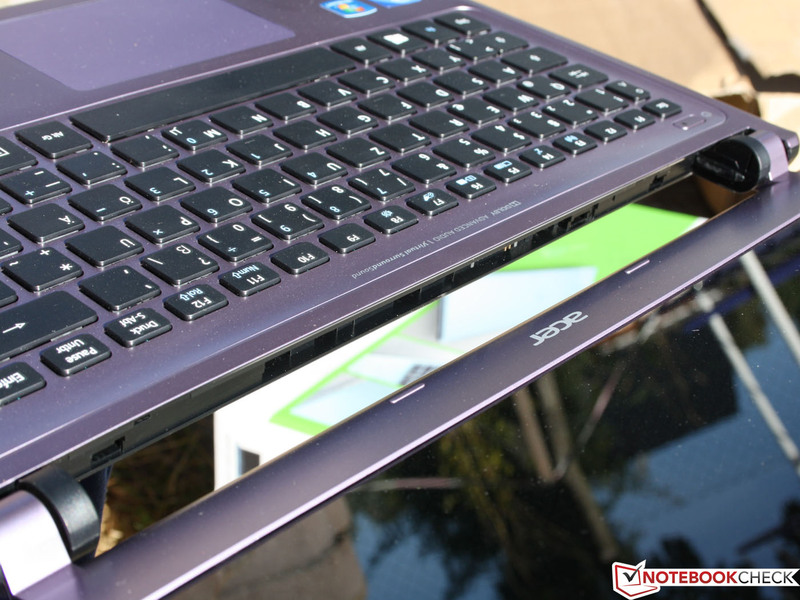 Does the 14-inch Acer Aspire V5-431 have the genes of an Ultrabook? 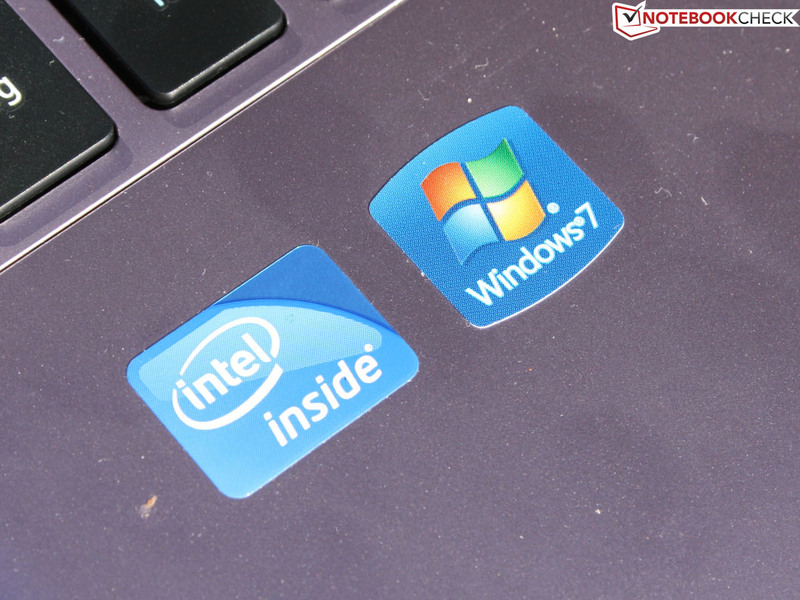 Intel's Ultrabook standard is not doing too well and sales figures lag far behind initial predictions. Is a subnotebook sporting less than 21 millimeters (0.83 inches) thickness just not appealing enough? Well, it probably is - but potential customers might wonder why they need to spend 700 Euros (~$900) or more for a slim and trim notebook. 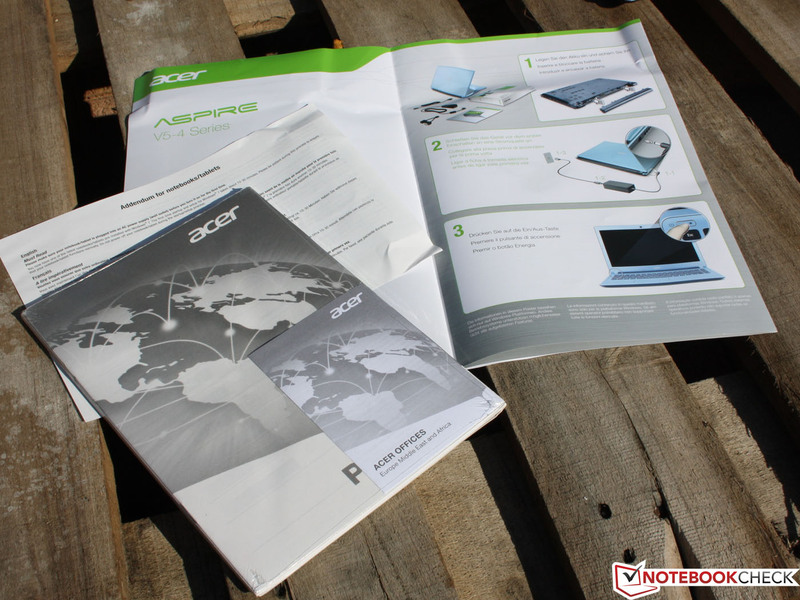 Enter Acer's Aspire V5-431 - a 14-inch, very portable subnotebook which retails for about 400 Euros (~$520). 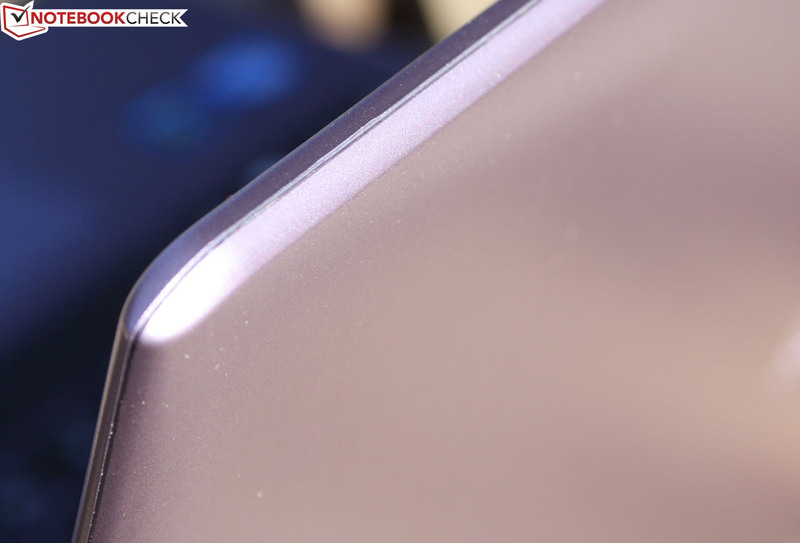 Its thickness of 23 millimeters (0.90 inches) means that it just barely misses Intel's specification for an Ultrabook. For tasks like surfing the internet, the model equipped with the Celeron processor (our review unit) ought to be sufficiently powerful. For about 100 Euros (~$130) more, Acer offers a Sandy Bridge model with a Core i3-2367M and an Nvidia GeForce GT 620M graphics card (Aspire V5-471G). 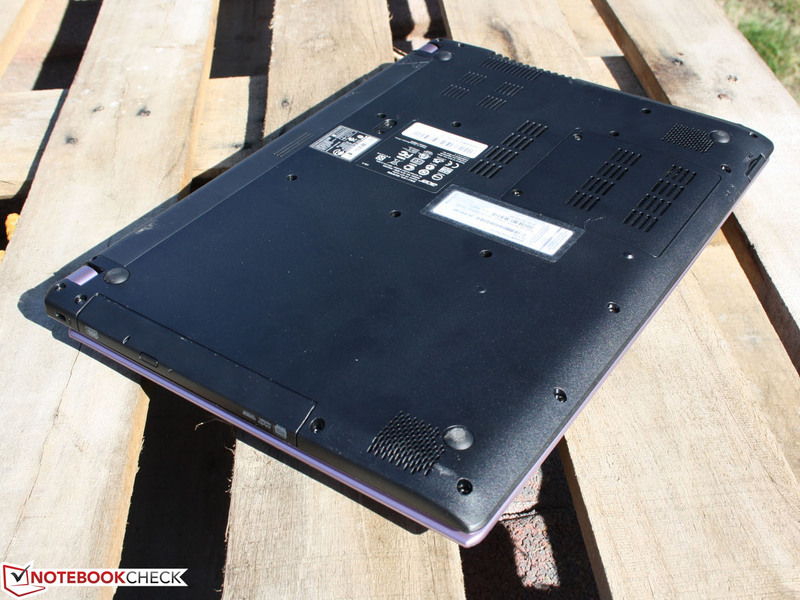 We already reviewed the 15-inch V5-571G, which features that particular processor and GPU. So how much Ultrabook flair does one get for comparatively little money? Can the Celeron CPU achieve decent run times despite a battery with only 37 Wh? Is the chassis appealing and sturdy or boring and flimsy? The similarity is uncanny and obviously intended: the 15.6-inch Aspire V5-531 features the same aesthetics, identical surfaces, and the same quality of construction. The 14-inch version we are reviewing here is just a tad smaller - which also means that there was no room for a dedicated number block. All other features are identical, however. The slim notebook boasts a constant thickness of 23 millimeters (0.90 inches) - that's not including the rubber feet, which are 2 millimeters (0.08 inches) thick. The bottom is completely flat and only features a small cover for the RAM modules (two slots). To access the hard drive or to clean the dust from the cooling fan, the entire bottom plate needs to be removed. Since we are evaluating a loaner system, we decided not to proceed. With a little bit of patience and the aid of a Phillips screwdriver, even the end user should be able to perform this task easily enough. The hinges feel secure and allow the display to be opened to a maximum angle of 170 degrees. At this point it doesn't stop firmly but rather in a somewhat spongy fashion. 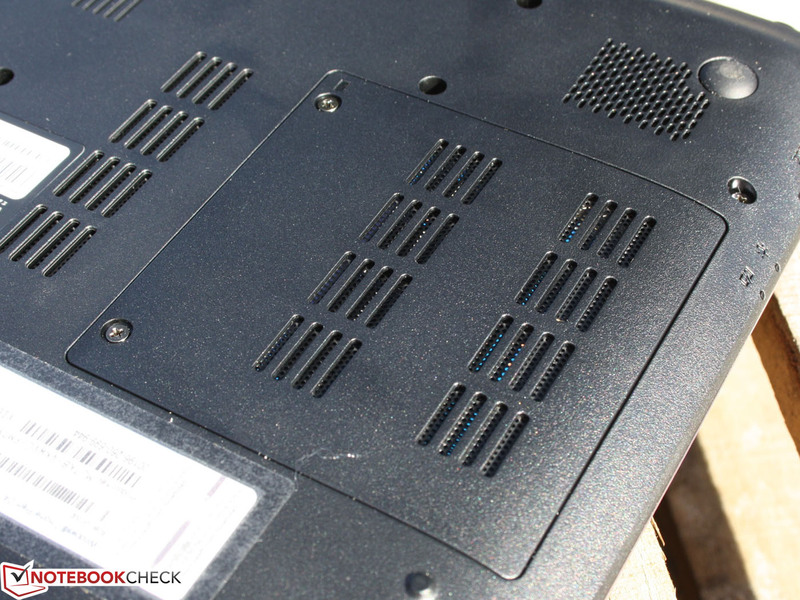 The display also teeters a bit back and forth when the notebook is subjected to vibrations. The optical drive is located underneath the right half of the keyboard and spirited typing resulted in some flex in this area. The optical drive is integrated pretty well though - better than the battery, which is secured in two spots but leaves a gap of up to 1 millimeter (0.04 inches) on the left side. We were able to twist the display lid fairly easily. We also noted some ridges/burrs in the material around the perimeter of the display lid and discovered two missing rubber feet on the display bezel, which causes the frame near the webcam to touch the area under the touchpad when the lid is closed. We would expect some wear and tear in this area over time. The communication features of the V5-431 are minimal but pretty typical for the class and price point. USB 3.0 is on board; so is Bluetooth. 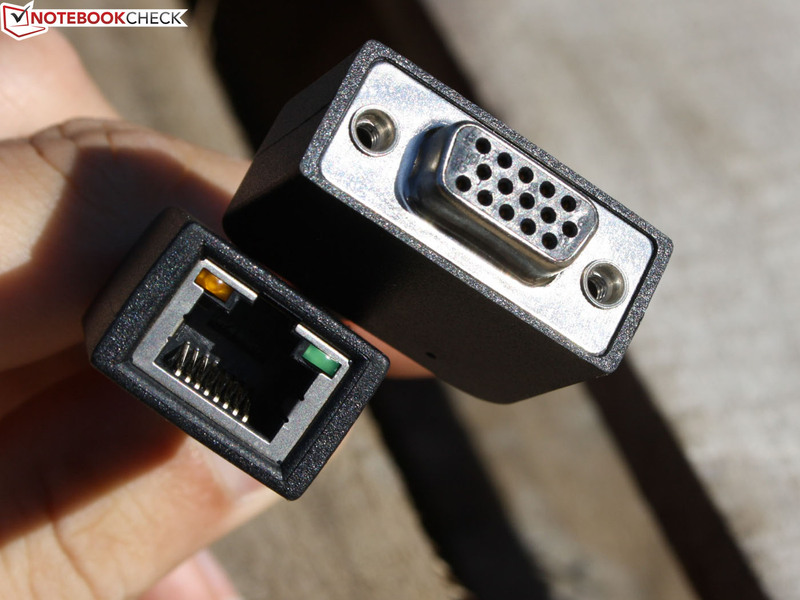 Both cabled Ethernet (RJ45) and VGA (for connections to older displays or projectors) require the use of special dongles, which are included. We like this implementation - the aforementioned ports are used a lot less than USB and HDMI, for example. Most users will probably prefer to connect to the internet without any cables, so the RJ45 port, which is powered by a Gigabit Ethernet module from Realtek (and requires the use of the proprietary dongle) might not see much use. The Atheros AR5BWB222 Wireless Network Adapter supports Draft-N and allows connection speeds up to 600 Mbit/s. When we tried venturing outside to get some distance between us and the wireless router (a FritzBox 7270 with the transmission strength set to 50%), we still had three bars and an acceptable signal at 30 meters (98.5 feet). We appreciate the fact that even our low-end version of the Aspire V5 comes equipped with Bluetooth 4.0. The VGA (640x480 pixels) webcam produces washed-out and pixelated photos. Outside (daylight) the quality improves somewhat. Useful: a green LED shows when the webcam is on. Aside from the aforementioned VGA and RJ45 dongles, the box only contains a quickstart guide and warranty information, as well as the fairly small power adapter which weighs 342 grams (including the cable) and produces 65 watts. The only way to cut down on the weight and size even more would be to use an adapter that gets plugged into an outlet directly - but those usually only supply about 45 watts. The Backup Manager allows the user to create a complete image of their laptop after the system has been set up. Since those buying a new system usually have data on the old device, a Migration Tool is also included. Instant Update is not a program to update drivers, but rather opens Outlook as soon as the lid is opened and syncs frequently visited websites. 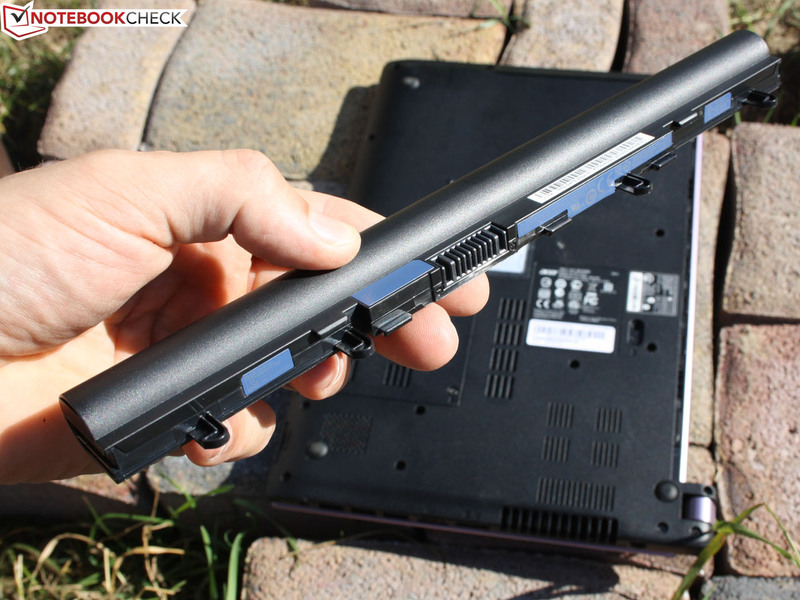 The warranty is 24 months via Collect & Return - not bad for a notebook in this price bracket. The Acer Advantage program allows an extension of the warranty to five years total with next business day service. An extension to three years with accidental damage protection (100 Euros / ~$130 deductible) costs 79 Euros (~$102). Good contrast - but grainy photos. The keyboard is certainly usable, albeit unimpressive. 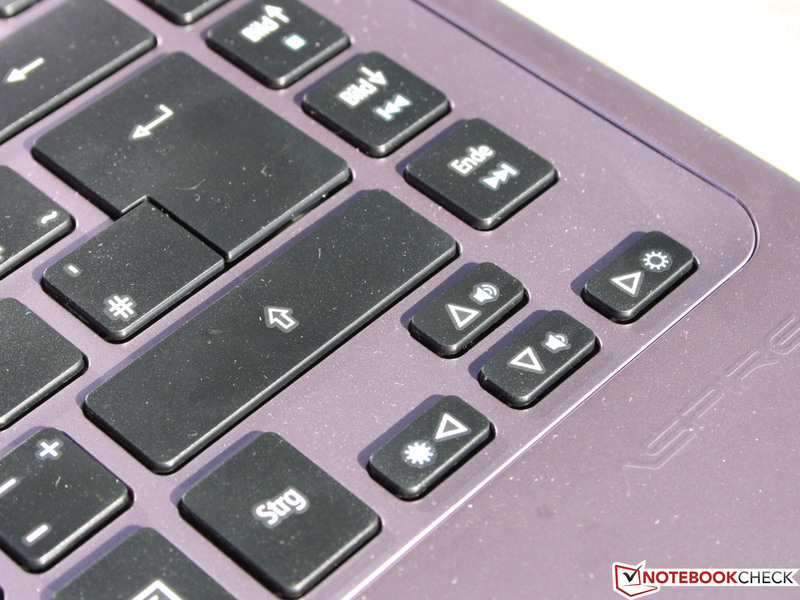 We already mentioned the keyboard flex in the area around the Enter key. The keyboard feels generally fairly soft, key travel is pretty short, and the feedback not very precise. The layout, on the other hand, is neat and functional and features large Enter / Shift keys and arrow keys that are separated from the main area. The Elan SmartPad (which is similar to a Synaptics ClickPad) does not have separate mouse buttons - rather, the entire surface is clickable. The matte surface area allows the fingers to glide easily and smoothly. 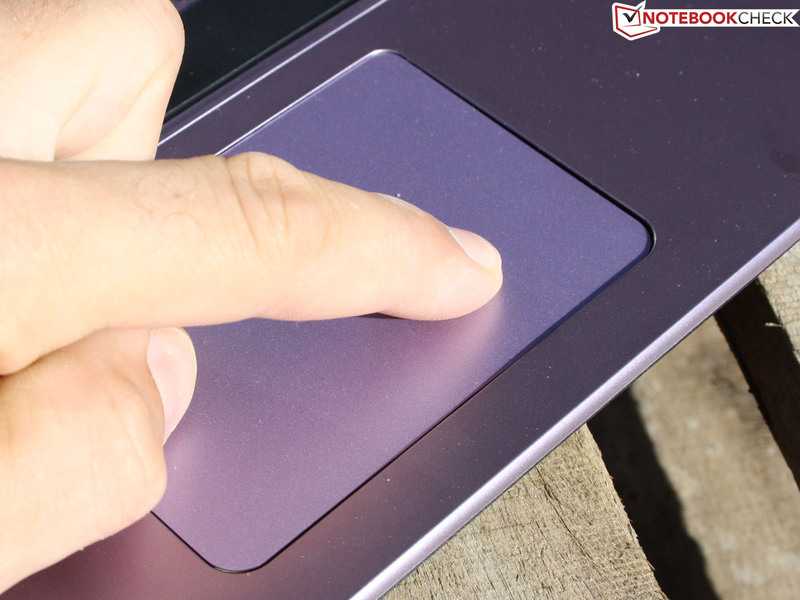 The touchpad supports multitouch gestures and vertical and horizontal scroll bars can be enabled, if so desired. We like the touchpad - more so than the somewhat spongy keyboard. 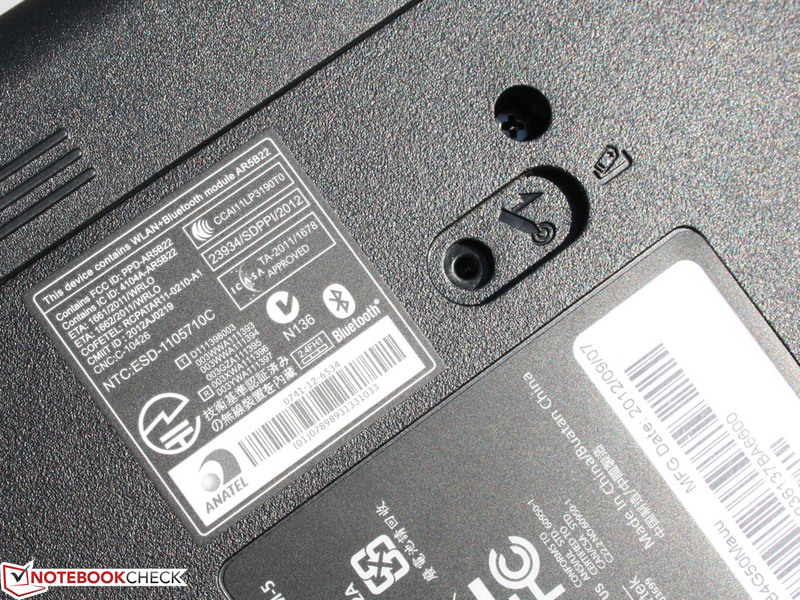 For this notebook, Acer decided to use a panel from CMD (Chimei-Innolux, also known as CMO) instead of an LG-Phillips branded one. The 14-inch panel (N140BGE-L42) with a resolution of 1366x768 pixels features low contrast as well as just adequate brightness. The distribution (196 cd/m²) is pretty even, but the average brightness of less than 200 cd/m² is nothing special - certainly not good enough to outperform other notebooks in this segment. While the screen quality is certainly on par with other panels in the low-price segment, there are some laptops that either feature a better brightness and/or a non-glare screen. The low contrast of 147:1 isn't really surprising either. The glare-type screen makes the colors look better than they are - but that does not change the results of our measurements. Even though the V5-431 is not going to attract any graphics or photo professionals, we still include a comparison to the color spaces: sRGB is only covered to about 60%. 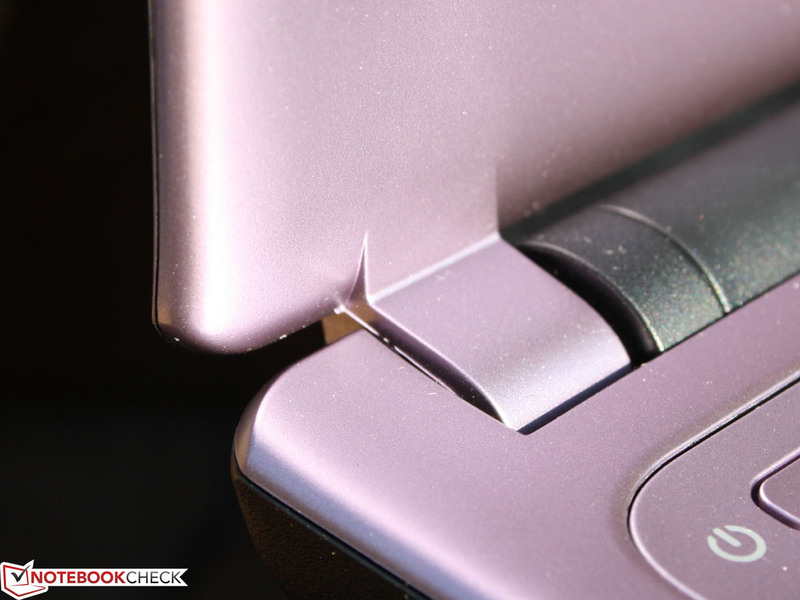 While that seems low, there are other laptops that do even worse - like the Lenovo IdeaPad S300. The brightness of the display panel by CMN is a paltry 196 cd/m² and therefore sufficient for indoors or dark environments - but not sufficient to combat the glare of the sun outdoors. In order to work reasonably well outside, a brightness level of above 250 cd/m² would be required. Watching a movie on the notebook is not much fun if there is more than one person trying to enjoy the film - not because of playback issues, but because colors start to invert at only 15 degrees deviation from vertical. Horizontally, the picture quality suffers at more than 40 degrees from the ideal 90 degrees. Overall, the panel is not well suited for watching movies. 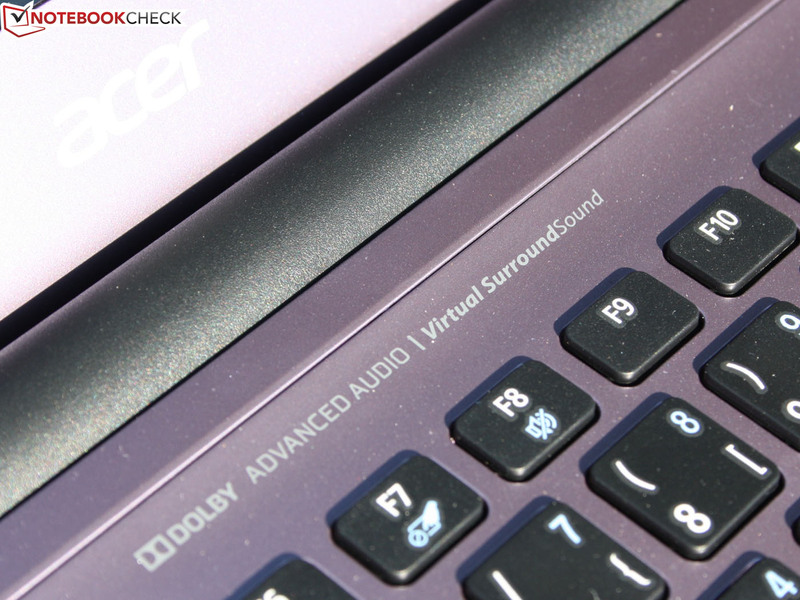 Acer's website lists the Aspire V5-431 equipped with a Pentium 967 as the only available option. Online retailers only carry the version with the Intel Celeron 887 (2x 1.5 GHz) - the same processor our review model is equipped with. The low-voltage processor (17 watts) is part of the older Sandy Bridge architecture (2010-2011) and is usually found in low-end 11.6-inch notebooks. The CPU lacks features like Turbo Boost and Hyper Threading. We will try to determine in the following section if it is worth waiting for the notebook with the Pentium CPU instead. The integrated graphics card Intel HD Graphics also features a Turbo mode and adjusts the clock speed between 350 and 1000 MHz. 4 GB RAM (1 module from Nanya Technology) and a Western Digital Scorpio Blue WD5000LPVT with 500 GB capacity round out the hardware selection. The Celeron 887 is probably one of the least exciting processors currently available. Nonetheless: we will compare this CPU to the Pentium 967 and the AMD E2-1800, since many notebooks equipped with the latter two choices can be had for about the same amount of money as our test candidate. The Cinebench R11.5 64 Bit Multi resulted in 1.14 points. Due to the lower frequency of its two cores (1.3 instead of 1.5 GHz) the Pentium 967 is about 17% slower. The fastest E2-1800 system (HP 655 B6M65EA) is a staggering 42% slower. The i3-2367M (Sandy Bridge) is not only more expensive, but also offers better performance: a plus of 18%. The scores for the above test remained the same regardless if we performed them while the notebook was plugged in or running on battery; the GPU performance took a small hit even though the frequency remained at a constant 1000 MHz (6.68 vs. 5.78 points; Cinebench R11.5 Shading). The results shown in the bar graph below for the Multi-Core test are confirmed when we run the Cinebench R11.5 Single: the processors we used for comparison are 3 to 43% slower. We don't have values for the Pentium 967, but even the faster (by 100 MHz) Pentium 977 is still slower by 3%. Those interested in performance won't find the processors we mentioned appealing - they are better off with at least an i5-3317U (see Aspire V5-571G), which offers Turbo Boost and comparable power consumption. The important takeaway here: compared to the Pentium, the Celeron CPU looks like it could be the better choice. A Celeron outperforming a Pentium? Let's see what PCMark Vantage and PCMark 7 can tell us. Those two tests simulate application load and tax CPU, GPU, HDD, and RAM - at times simultaneously (depending on which sub-test is running). A fast hard drive or SSD does improve the scores here. 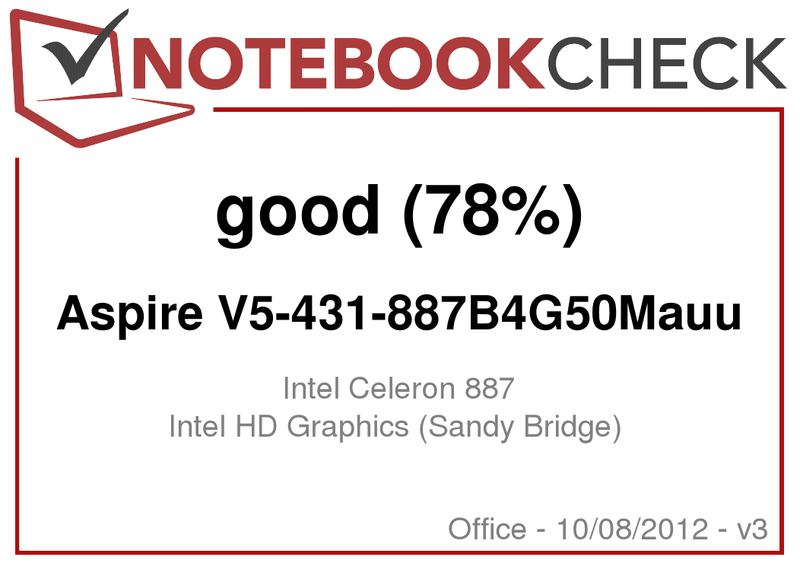 Subjected to the PCMark 7 benchmark test (1450 points), the Celeron shows a plus of 23% when compared to the AMD E2-1800 (Lenovo ThinkPad Edge E135, 7200 RPM HDD). Systems based on the Pentium processors are only marginally slower (Pentium 967: -6%) or a little faster (Pentium 977: +6% - Edge E130). How systems with the i3-367M fare depends mostly on the type of storage device: the Edge E130 (HDD) is 8% slower. The Asus UX32A (SSD Cache, HDD), on the other hand, is about 20% faster. The PCMark Vantage test (3629 points) confirms the findings: AMD E2-1800 (-26 to 38%), Pentium 977 (-17%), and 2367M (-6 to +17%). The hard drive in the system - a Western Digital (model WD5000LPVT-22G33T0) - is partially responsible for the still decent performance. The HDD-Scores in PCMark Vantage (3630 points) and PCMark 7 (1480 points) are not too bad, although they lag far behind SSDs (+80 to +900%) and a bit behind faster 7200 RPM HDDs (0 to +12%). We measured a throughput rate of 90 to 118 MB/s for sequential reads. The performance drops quite a bit when smaller chunks are read (4K: 0.449 MB/s). The slow random access time of 19.6 ms is the last contributing factor to a typical (and sedate) hard drive performance - compared to SSDs, at least. If you plan on swapping out the HDD for an SSD, please note that only a 7 millimeter 2.5-inch SATA model will fit. The HD Graphics, which is integrated in the Celeron CPU, stays within the specified frequency of 350 to 1000 MHz - even when the notebook is running on battery power. The Cinebench R11.5 Shading Test shows a small decline in performance from 6.68 points down to 5.68 points. Only during a heavy stress test, when the Celeron is pushed to its limits, does the frequency drop down to between 800 and 850 MHz. 3D benchmarks are either very low or we couldn't run them at all (no DirectX 11 support). We recorded 2274 points when running 3DMark 2006 (the same GPU scored 2293 points in the Pentium-equipped Edge E130). The Radeon HD 7340 of the E2-1800 is only marginally better (+ 10%) but the HD 3000 (for example i3-2367M) scores up to 42% higher (Asus UX32A). Evaluating the gaming performance of a Celeron system sounds preposterous, to say the least. We did check though to see if some games would run on their lowest settings. The result: aside from games which have really low requirements (like FIFA 13), all titles were more or less unplayable. Even the older game Risen (2009) exhibits lag and stutters on low. To achieve better results, at least an HD 4000 (found in the Ultrabook processor i5-3317U, for example) would be required. 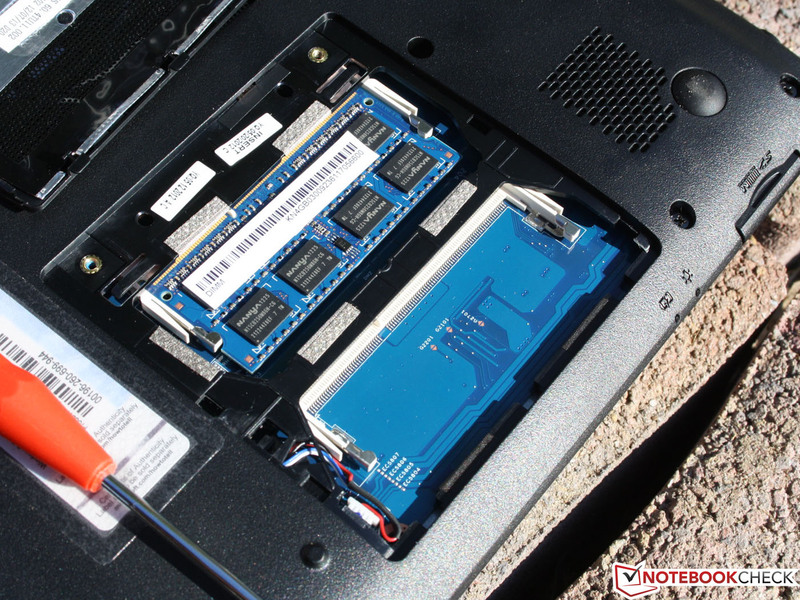 The AMD APU E2-1800 is not an alternative, as our reviews of the ThinkPad Edge E135 and the HP 655 show. The fan in the 14-inch system keeps running at fairly constant speeds most of the time. Only during idle does the fan shut off occasionally. System noise is unobtrusive and between 32 and 33 db(A) when the fan is spinning. When the fan is off, the hard drive is the only source of noise - at 29.8 dB(A), the hard drive is almost as quiet as the room we are conducting our tests in. When the hard drive is performing read/write operations, the noise level jumps to a comparatively loud 32.7 dB(A). Although the optical drive remains pretty quiet while watching movies, more CPU intensive tasks cause the fan noise to increase substantially. When we ran tests at medium (3DMark 06) and high load levels (GPU+CPU), we recorded 36.5 and 40.7 dB(A) respectively. Even though the fan is quite audible, the noise remains constant and the frequency is low enough to not be annoying. How does the 23 millimeter (0.90 inches) system handle the heat? The processor should not be an issue, as the low-voltage versions are designed for slim and small systems. The temperatures do not vary much - regardless if the system is under load or not. The surface temperatures of the 14-inch notebook remain fairly constant throughout and only exceed 30 °C (80 °F) in some spots. Our stress test pushes the systems to their thermal limits. Although this is not a scenario encountered during daily use, it still shows us that this particular notebook can be safely placed on the lap: we measured about 43 °C (109.4 °F) on the bottom (in the center). 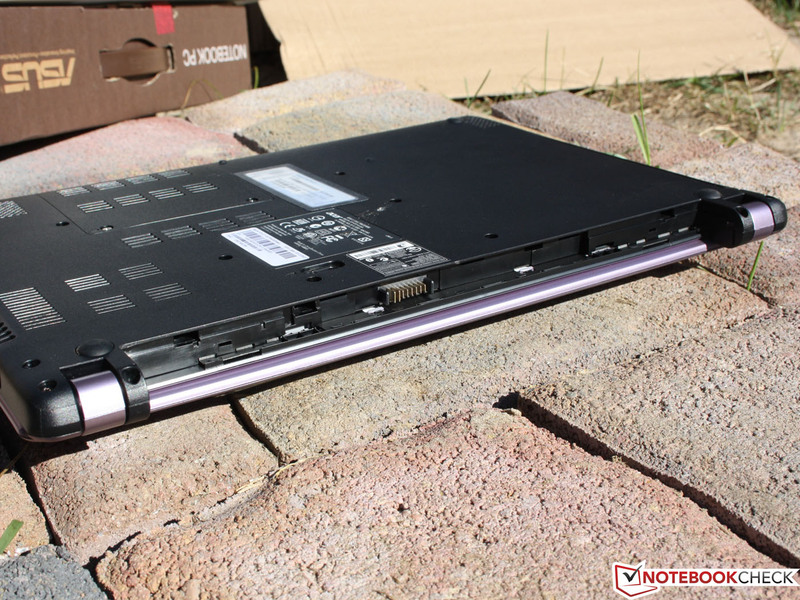 The 14-inch Lenovo IdeaPad S400 is even more impressive: the underside only reaches 28 °C (82.4 °F). Thermal throttling is hardly ever an issue with notebooks lacking Turbo Boost mode. The Celeron in the V5 maintained its 1.5 GHz even during the stress test. The sensor monitoring the CPU recorded 67 °C (152.6 °F) - well within acceptable limits. (±) The average temperature for the upper side under maximal load is 36.2 °C / 97 F, compared to the average of 29.4 °C / 85 F for the devices in the class Office. (+) In idle usage, the average temperature for the upper side is 30.2 °C / 86 F, compared to the device average of 29.4 °C / 85 F.
(-) The palmrests and touchpad can get very hot to the touch with a maximum of 41.1 °C / 106 F.
(-) The average temperature of the palmrest area of similar devices was 28.2 °C / 82.8 F (-12.9 °C / -23.2 F). Dolby Advanced Audio offers presets but allows manual configuration as well. The Aspire V5-431 houses two stereo speakers underneath the palm rest towards the front. 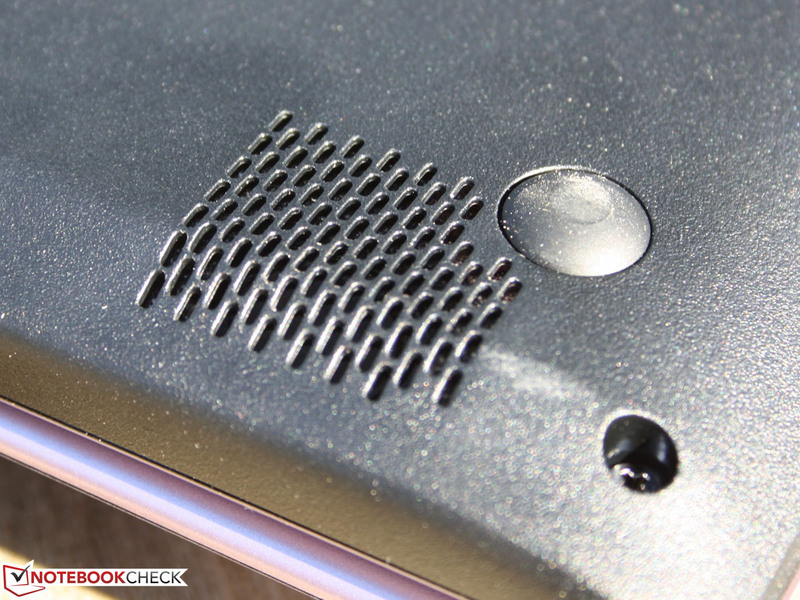 Since the rubber feet on the bottom are quite tiny, the reflection does not contribute a lot to the overall sound. 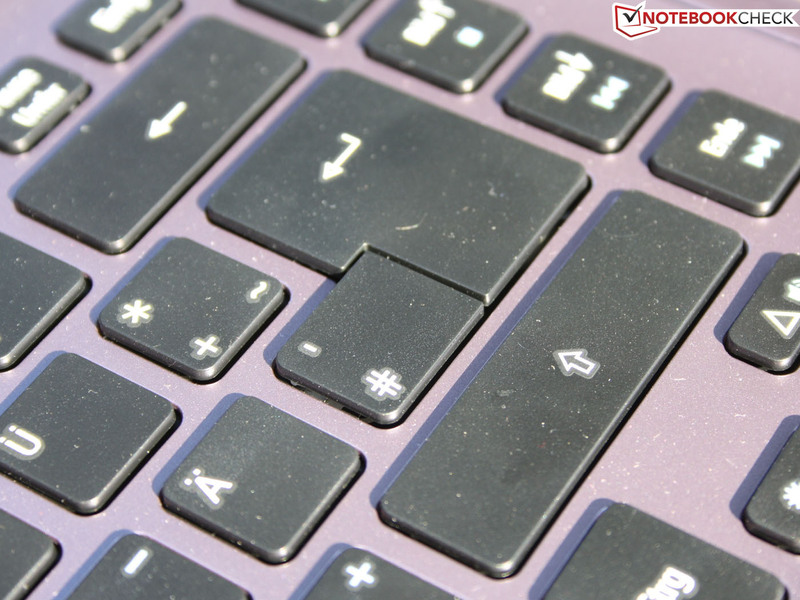 Nonetheless: if the notebook is not placed on a hard surface, the resulting sound is extremely tinny and weak. The Dolby Advanced Audio codec does improve the (surround) sound. The mids are over-emphasized, while highs and lows are either muddled or completely lacking. We achieved the best results using headphones and external speakers via the audio combo-jack. Overall loudness is sufficient and the speakers remain undistorted even at high volume levels. Power consumption under load (26 to 32 watts) is either identical to other notebooks in this category with the AMD E2-1800 APU (15.6-inch HP 655: 26 to 32 watts) or almost identical to Pentium systems (15.6-inch Aspire V5-531: 28 to 34 watts). During idle, the V5-431 consumes only 8 to 10 watts. Looking at the power consumption of the higher-performing Core i5 Ultrabooks, the power requirements of the Celeron notebook seem acceptable. The Lenovo IdeaPad S400-MAY8LGE or the Toshiba Satellite U840W - both of which are 14-inch systems equipped with the i5-3317U - consume quite a bit more at 30 watts and 43 watts respectively. Most of the other 13.3-inch Ultrabooks with the same processor need about 36 watts during the stress test. The small power adapter supplies 65 watts and seems adequately sized. The small battery (37 Wh) requires 2 hours 18 minutes to reach a full charge. 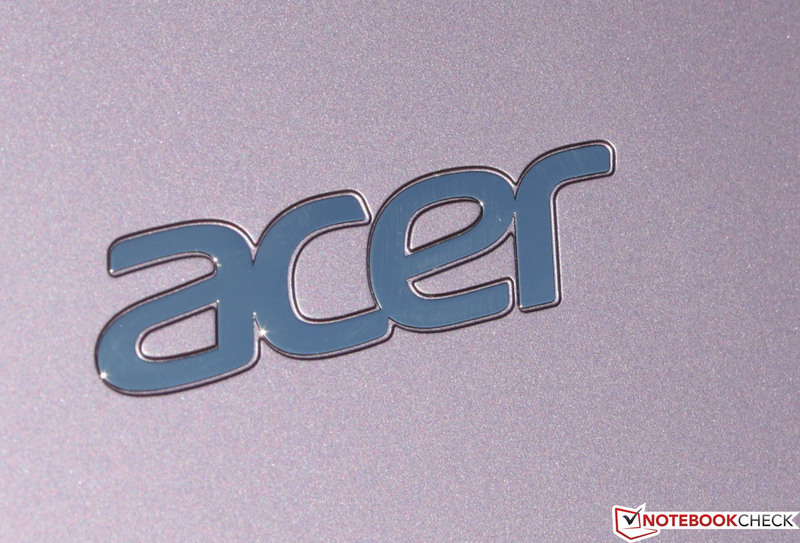 Acer limited the possible run times of the other members of the V5 family - the 11.6-inch V5-171 and the 15.6-inch V5-531 - by outfitting them with very low-capacity batteries. 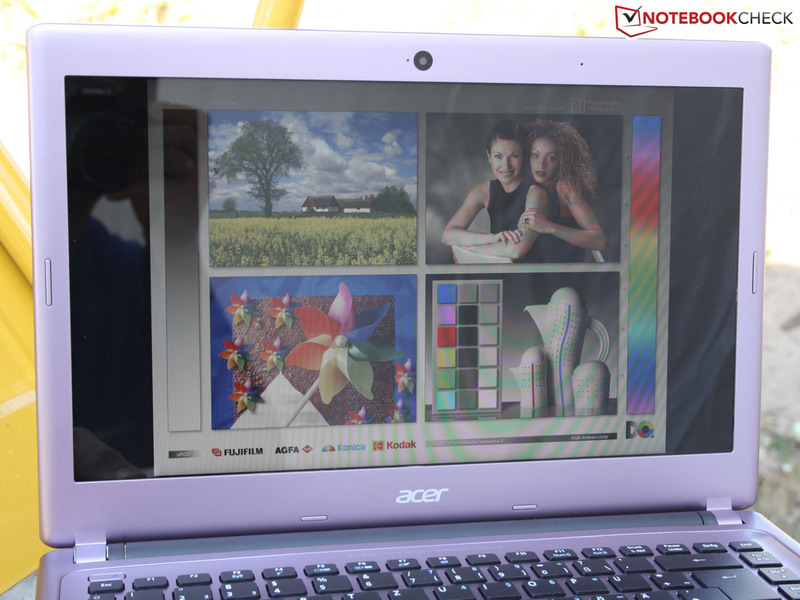 The new 14-inch model is no different: the V5-431 lasted only 3 hours in our WLAN test. The V5-171 (3 hours 33 minutes), V5-571 (3 hours 15 minutes), and the V5-531 (3 hours 24 minutes) performed about the same. Too bad: the Celeron (or Pentium) equipped model certainly could achieve a very decent battery life. The Lenovo ThinkPad Edge E130 (Pentium 977) shows how it's done: 63 Wh keeps the 11.6-inch system running for over 6 hours. For our WLAN-Surf test we set the screen brightness to 150 cd/m² and let an automated script visit different websites (some with video) every 40 seconds. For our DVD test, we set the screen to its maximum brightness - the resulting battery life is very close to what the V5-431 achieved during the WLAN test. 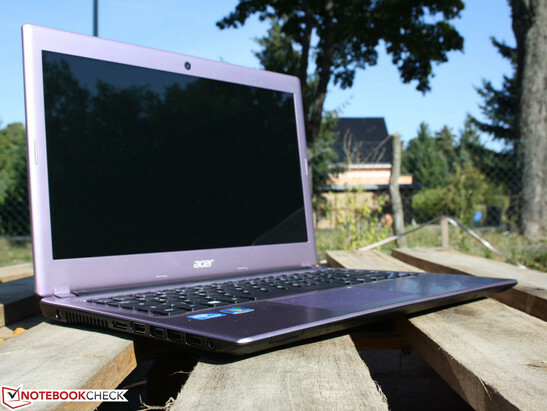 The 14-inch Acer Aspire V5-431 offers - for a fair price - what the average user might be looking for when considering a new notebook: a thin chassis, good looks, functional input devices, and an easily transportable 14-inch form factor. The Celeron CPU is no powerhouse - but that's perfectly OK for office-type tasks. We like the solid base units, the matte surfaces and the generously sized input devices. Mobility is hampered by the low-capacity battery and the resulting three hour battery life. Even less appealing is the glare-type panel which is prone to distracting reflections. The low-voltage power doesn't create a lot of heat and power consumption is low. The 32 watts we recorded during the stress test (high performance profile) are below the requirements of an Ultrabook equipped with the i5 processor. 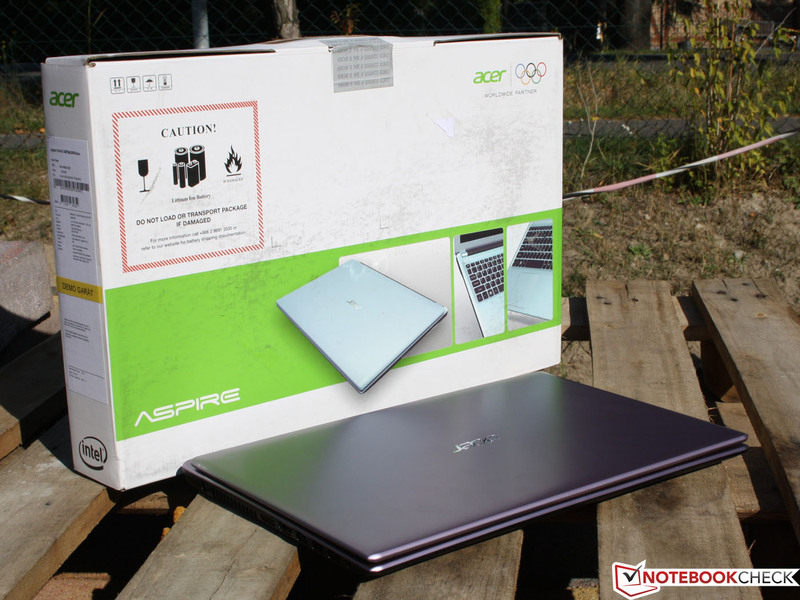 Those interested in a 15.6-inch system should take a look at the Aspire V5-531. 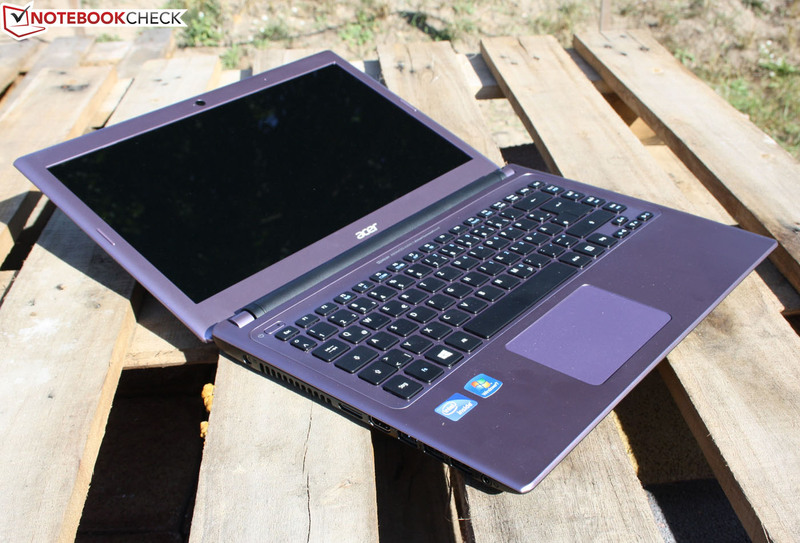 The Pentium-equipped notebook hits the same price point, but doesn't offer better performance. Acer Aspire V5-431-887B4G50Mauu: Celeron or Pentium - it doesn't matter: the mediocre battery life is due to the low capacity of the battery. A small cover at the bottom hides the system RAM. Two slots are available; one is used (4 GB module). Useful: a green LED indicates if the webcam is on or not. Unimpressive: the sound of the built-in stereo speakers can't hold what the Dolby logo promises. The speakers are under the palm rest. The table reflects the sound. 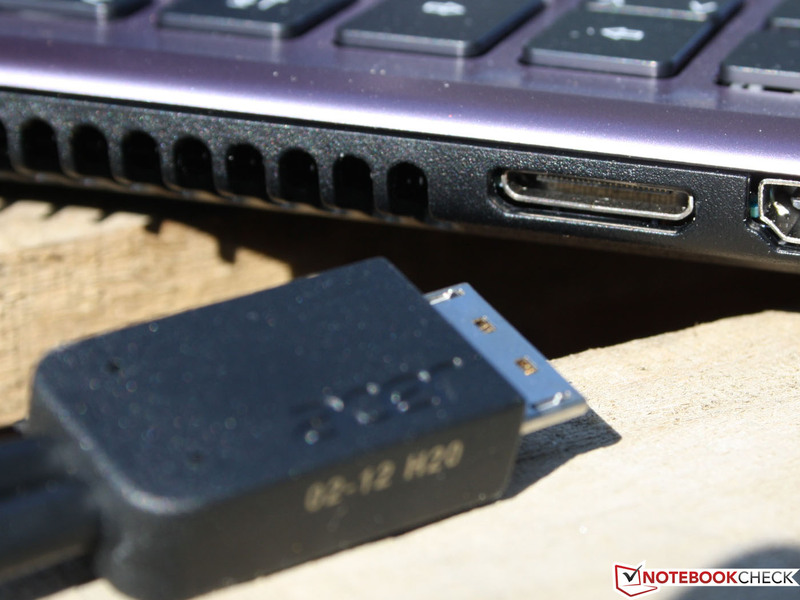 To keep the height of the notebook to a minimum, Acer doesn't include full-sized RJ45 (Ethernet) and VGA (D-Sub) ports. The included dongles allow the use of RJ45 and VGA. 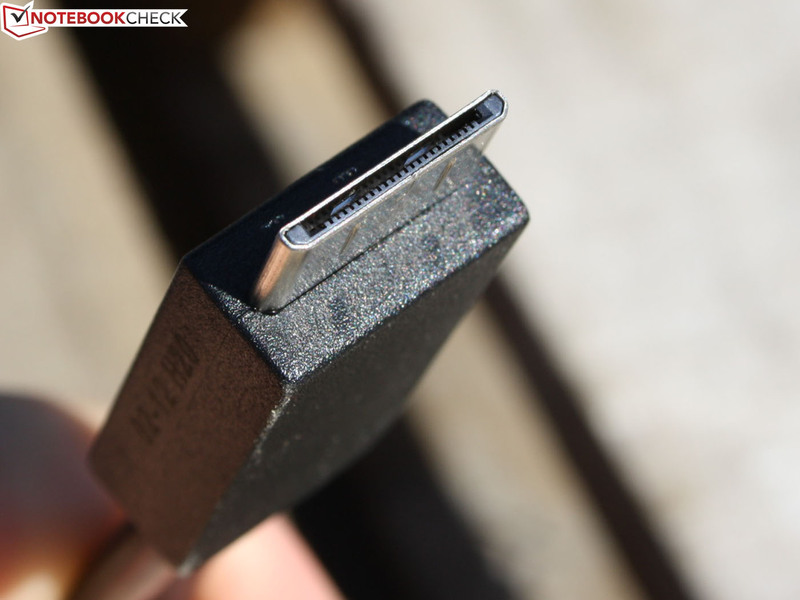 HDMI and USB (2 x 3.0) are easily accessible. 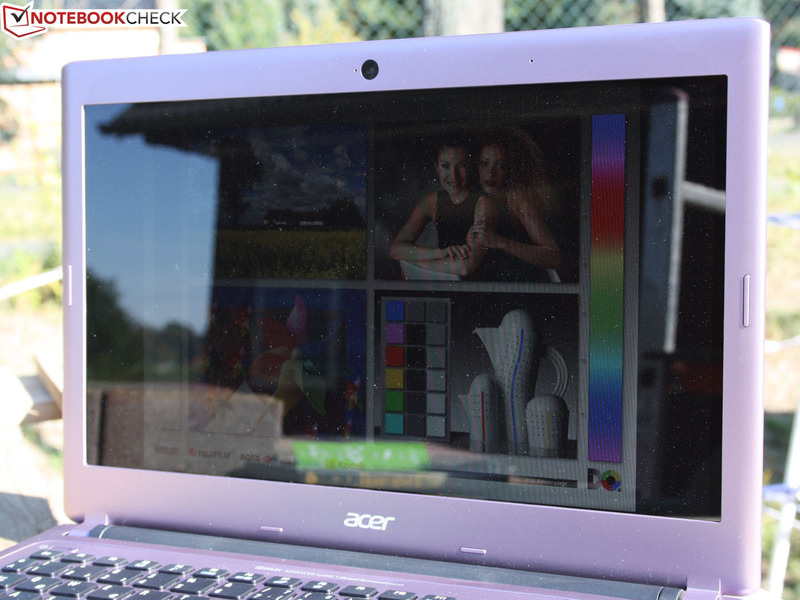 Acer Aspire V5-431: the glare-type panel is highly reflective - not uncommon in this price segment. 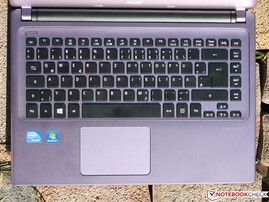 Acer Aspire V5-431: The light purple color is not nearly as obnoxious as one would think. The notebook can be used without the battery - but of course there is a rather large empty spot. 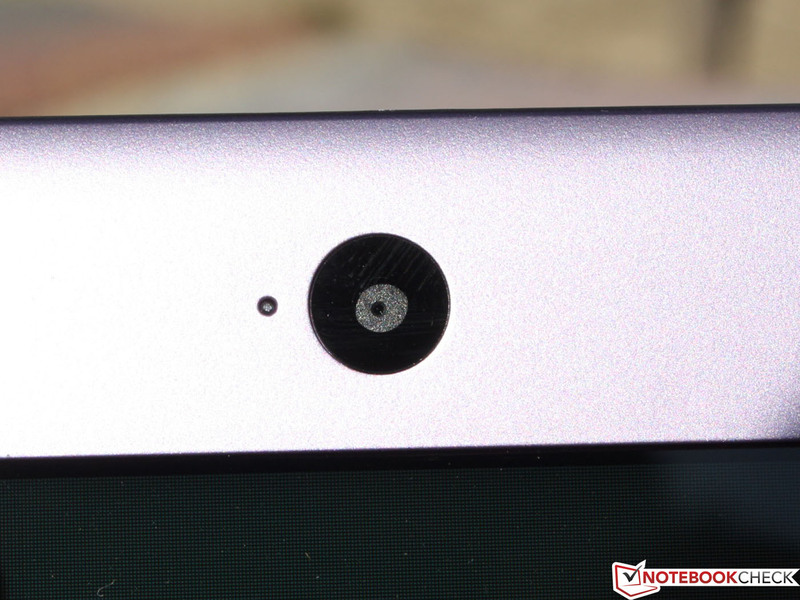 The low weight of 250 grams hints at the low capacity of the included battery. But 800 Euros is just too much? Acer might have a suitable 14-inch notebook - for about 400 Euros. 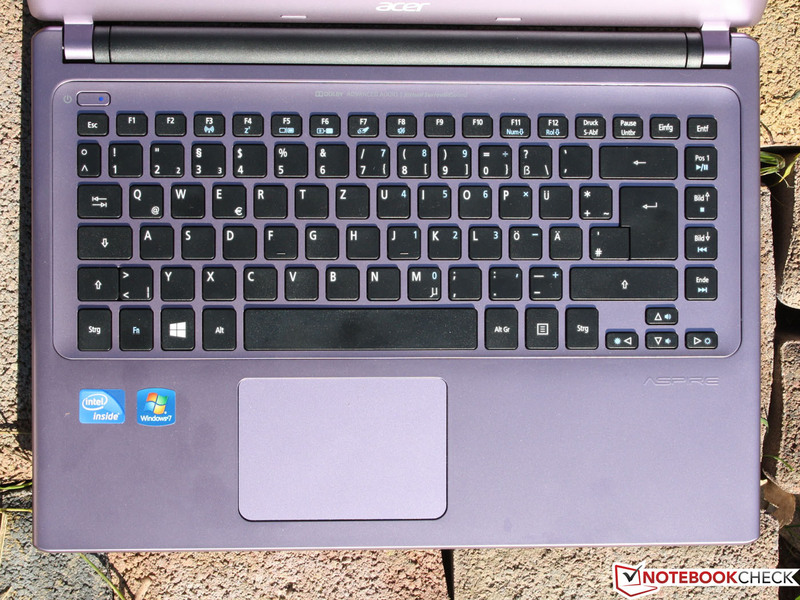 The Aspire V5-431 features rather inexpensive hardware - the Intel Celeron 887. Since the notebook comes equipped with a low-voltage processor, the battery life is still not too bad at three hours. Considering the battery only has 37 Wh, this time is fairly decent. The DVD drive plays movies for about three hours. Build quality is better than we would have expected. The base unit is rigid despite the optical drive. 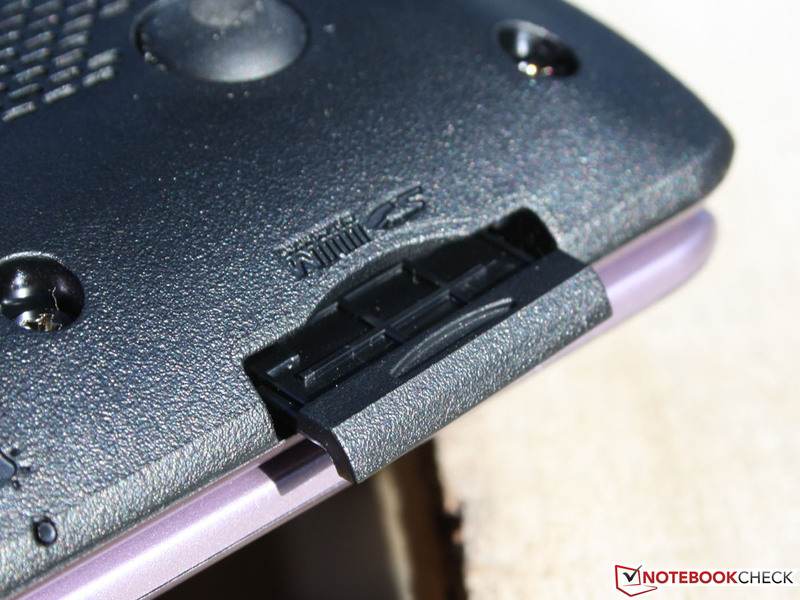 The hinges hold the display in any position. The gaps in the material are pretty uneven (burrs). 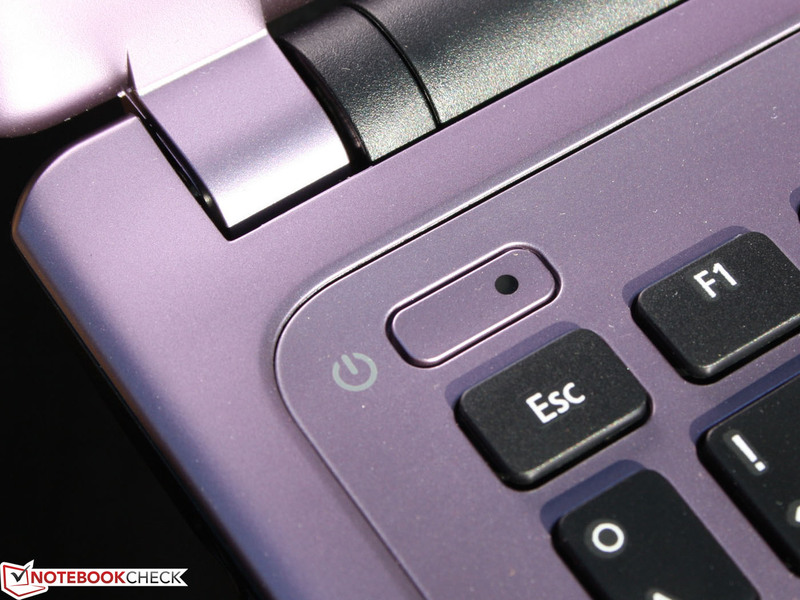 The keyboard flexes above the optical drive. The large ClickPad features decent travel and is easy to use. The display lid itself is pretty stiff but can be twisted when grabbed at the corners. 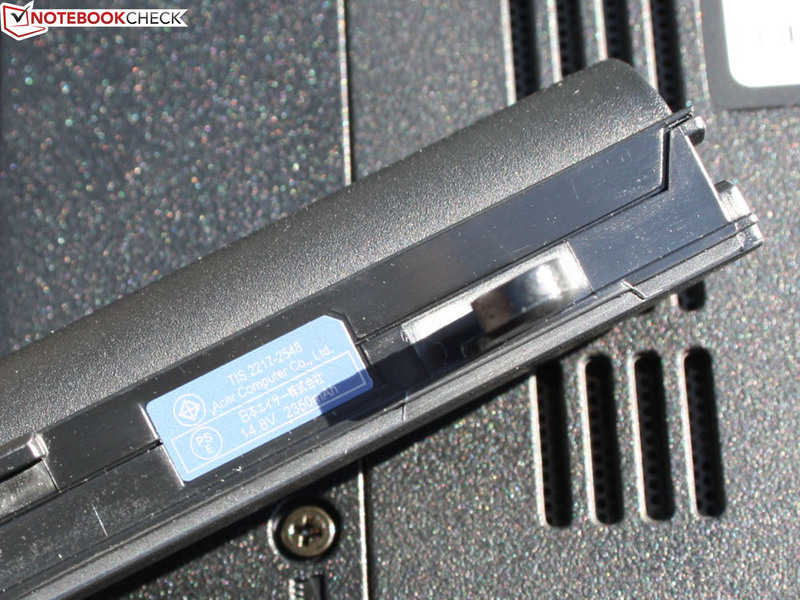 The battery is held in place using Acer's typical single lock. 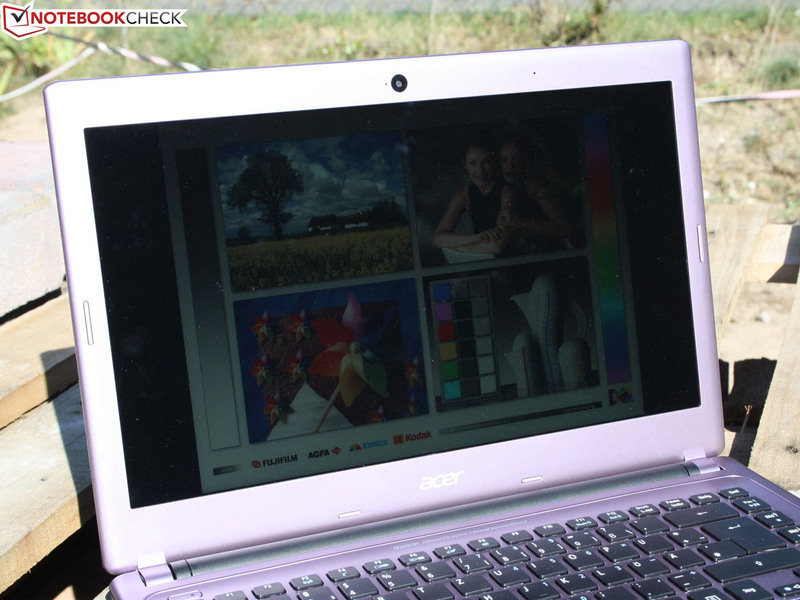 Acer Aspire V5-431: Attractively priced entry-level notebook with the genes of an Ultrabook. Demanding customers won't be very happy, however. A thin notebook for an entry level price. If your are not into games and converting media files is not on the agenda, the Celeron 887 CPU provides enough performance. 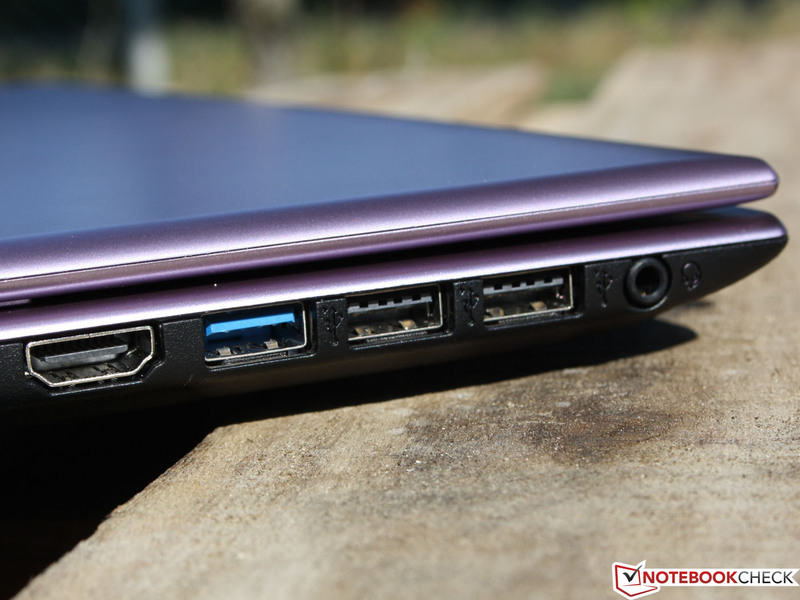 Since the notebook utilizes dongles for RJ45 and VGA, the profile is slim and trim. Enhanced mobility. Even lower priced notebooks can feature a high battery capacity and a non-glare display - case in point: the ThinkPad Edge models E130/E135.